How does your organization connect the dots from the myriad of data streams coming from multiple applications such as CRM, Spreadsheets, SharePoint and accounting systems? For most organizations, trying to make sense of all this results in DATA OVERLOAD. MyMedia has the expertise to take your data and visualize it in a coherent and organized flow. 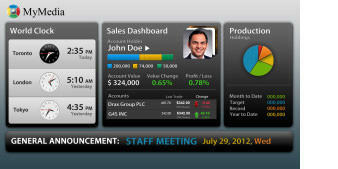 Our dashboards can merge all YOUR data and make it accessible on any screen, anywhere. Our solution displays real-time insights so that your team can take actionable steps and operate with greater efficiency. Our data visualization dashboards are dynamic and easy to read. This enables delivery of relevant information at the right time and place to connect the dots so your team is empowered and informed to make the right decisions. Our talented team of Data Visualization Dashboard Developers in New York and Toronto are happy to add your organization to our growing list of satisfied clients. Call us today at 1-866-636-0636 ext 224. Or fill in our contact form for us to contact you.